Tag #17921 - Cache U.K. This tag was previously released in 2011 into British geocaches by its previous owner. It is composed of a geocaching "G" symbol, superimposed on a British "Union Jack" flag. If you find one in a cache it's yours to keep! As its new owner, this tag will be making a comeback soon, perhaps with a colour change too. 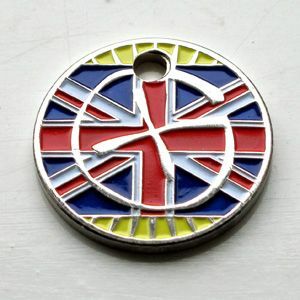 The main aim is to release it once again into British geocaches, and it will be available at events and to buy in sets of 10 via the UK Pathtag Club website. WISHLISTS: There are several wishlist requests on this tag, and I will be aiming to fulfill all of these as soon as the tag is remade. - part of the original Opencaching network & the only British based cache listing site.